Gary Barlow and the Commonwealth Band have taken the top spot in the UK charts this week, with 'Sing.' 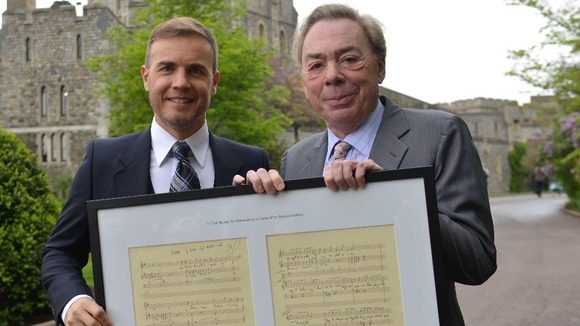 The track was written and recorded for the Queen's Diamond Jubilee and was accompanied by a BBC documentary showing Barlow travelling the continents on the hunt for musicians to perform on the track. 'Sing' sold 142,000 following the concert on 3rd June 2012 and claims this week's No.1 single spot, with Gary Barlow also claiming a No.1 album with his commemorative record of the same name. All proceeds of the album go to the charities endorsed by the Queen for her Diamond Jubilee. 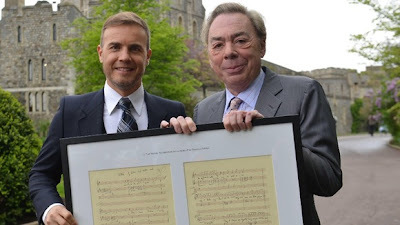 At a special meeting at Windsor Castle Andrew Lloyd Webber (r.) and Gary Barlow officially presented Her Majesty Queen Elizabeth II with a special anthem they have jointly composed in honour of her Diamond Jubilee.